If I was asked to name my pick for best restaurant in Tokyo to this date then it would be this little place. Makoto. Hidden in a small dark alley in Nihonbashi, you would never guess the quality of food that comes from this little steakhouse that sits about 10 people. I am always amused at the bewildered look on my guest’s faces as I guide them through this alley adorned with entangled clothes lines and storage boxes filled with liquor for the first time. The road leading to this restaurant may not be scenic, but politicians, actors and ex prime ministers have definitely sat at Makoto’s table. There is no sign at the door and I remember ringing the wrong door on my first visit. When you get the right door, you enter a cozy little restaurant with bar seats furnished in light wood. The elderly chef will always greet you with a smile and try to converse in his limited English, making you feel right at home. Makoto doesn’t have a set menu but the chef will ask if you would like appetizers or just the steak. This is what I usually have. Followed by the most delicious raw beef sashimi ever. 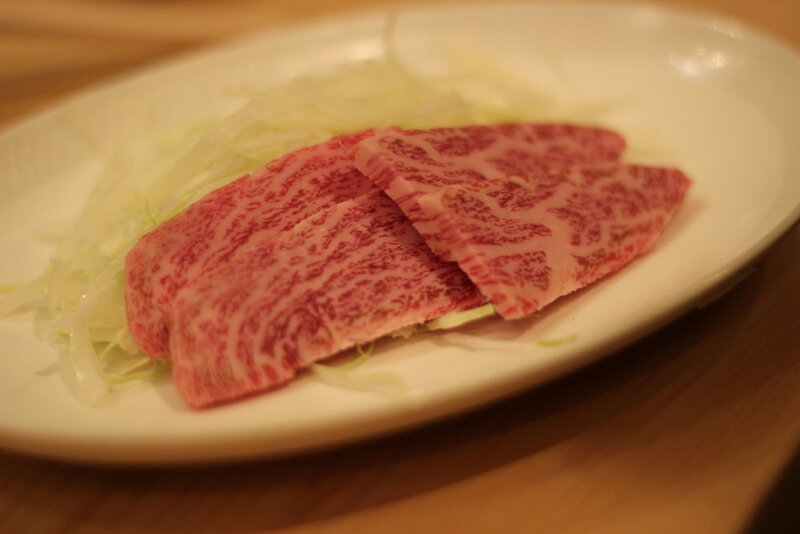 If you look like a foreigner, the chef will always ask… “Raw beef ok?”. Trust me it is more than ok. The beef melts in your mouth in such a wondrously delicate way, you start wondering if this really is raw beef that you are swallowing. A simple dish of the most deliciously sweet shrimps fried in bread crumbs are next. 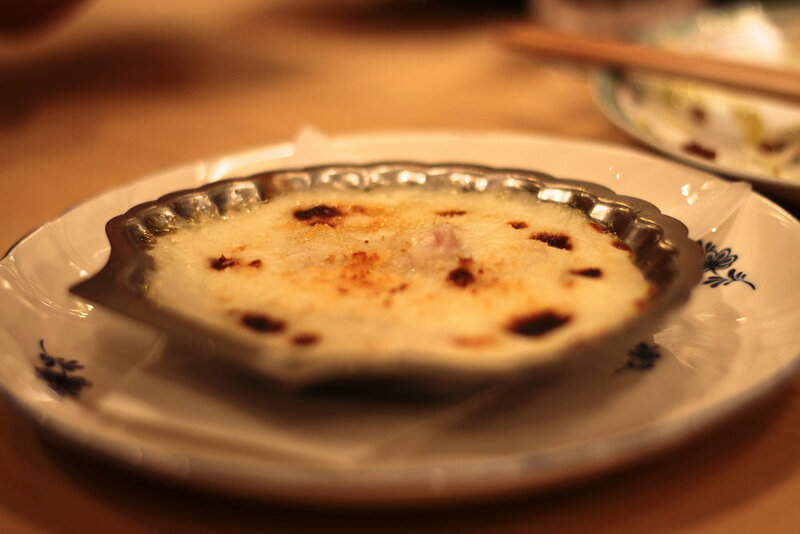 One of my favorite dishes follows, a mini bowl of clam gratin, Japanese style. So perfectly smooth and silky you wish you could lick the bowl clean. For the next dish, the chef usually asks another question if you look like a foreigner. “Ox tongue ok?”. I suggest you nod because this next dish is absolutely divine. The ox tongue that comes with some grated wasabi on top of it is so soft you won’t even have to bite through it. Last but not least, the wonderfully savory steak. At this point, I’m usually so full I hand half my steak over to be made into a sandwich that I’ll have for breakfast the next day. The chef will also ask you if you’d like some garlic rice after the steak and I suggest you try it. Ask for a small portion if you are too full. As the saying goes, dessert goes into another stomach, so I always have room for this simple dessert which I find totally brilliant. Seared white toast drizzled in honey and sprinkled with a little salt. It looks so simple I tried doing it at home a few times but it failed to come out even close to Makoto’s. If you can stomach a jolt of caffeine then I suggest you end your meal with this exquisite irish coffee. It might keep you up all night but you should try it at least once. Finish every drop, the last part is the best. If not, opt for the refreshing iced tea that comes spiced with a little brandy. This wonderful feast will set you back about 30.000 yen per person, but if you ask me, its absolutely worth it!.